There’s always a bit of a risk in getting a tattoo — of course, there’s the possibility you’re going to regret putting your boyfriend’s name on your thigh. But Catt Gallinger, a model from Ottawa, Ontario, is currently struggling with a much more serious consequence..
Catt Gallinger from Ottawa is recovering slowly but steadily over the past month following her decision to get a sclera tattoo, which colors in the whites of the eye. Gallinger has taken to Facebook to share the shocking results of her treatment, which she has now labelled a “massive mistake,”. The former pet nutritionist is now unable to see fully out of her left eye, four weeks after the procedure took place. Upon noticing the purple liquid oozing from her right eye, Gallinger was rushed to hospital where she was administered antibiotic eye drops. However, the drops had a reverse effect, leaving her with a grossly swollen eye that blurred her vision on week later. She was then given steroid drops, but these only exacerbated her condition further, causing the purple substance to clump around the cornea area. Doctors believe the equipment used for Gallinger’s procedure may not have been entirely sterile and therefore could have caused an infection. Hospital staff have informed Gallinger that she will never fully recover and her eyesight will remain compromised and could cause her to lose her vision completely. 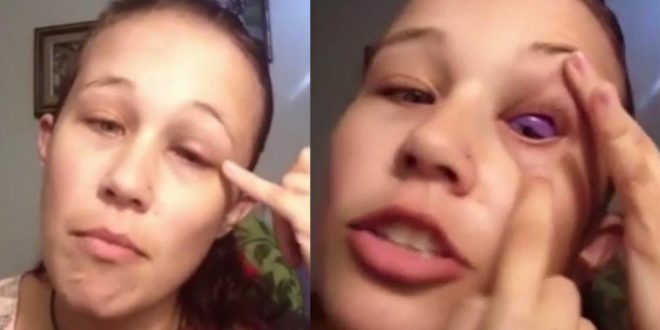 In an emotional video posted to the model’s Facebook page, she revealed that her vision has since improved. However, she revealed that her mental health remains extremely volatile as a result of her experience. “My hair’s falling out in clumps, there’s bald spots underneath this. I’m 90lbs and my weight keeps dropping, even though I eat,” she says in the teary-eyed clip in which she is visibly traumatised. “I’m this close to suicidal, I’m this close,” she said, explaining that she may or may not now require surgery. Friends and family have responded by offering their support on Gallanger’s Facebook page. She is strongly advising people against considering the treatment, which was advocated by Californian bio-hackers in 2015, who claimed that scelra tattoos gave them night vision. Coffee cancer warning: Does coffee cause cancer?